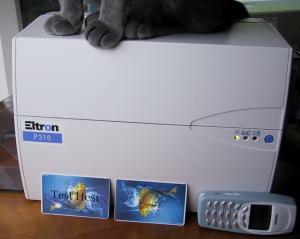 An Eltron P310c printer with two test cards, my Nokia 3410 for scale. Important note: This is not a windows driver, nor is it a standard driver for any other OS, it is a command line utility that you use to send an image to the printer to have it print a single card. 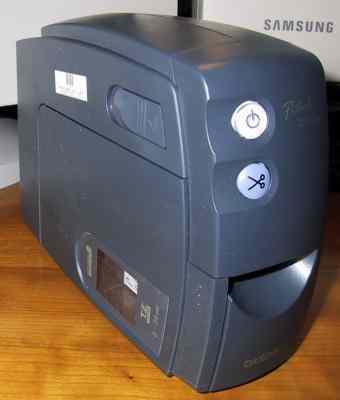 Eltron makes this very nice and reasonably sane printer for printing creditcard sized plastic cards, it's only fault is that it uses the printer port rather than Ethernet or USB so it's slow and hard to get info from. Please read the README / TODO files in the distribution for a complete description of what the driver does and how to use it, note that the driver only supports Eltron P310C with a CMYKr ribbon. The latest version of the driver may be found here, licensed under the GPL, (warning: it unpacks in the current dir): eltron_p310c.tar.gz [892K]. New (12/3 2003): The driver has been enhanced with magnetic track writing by Jason rust, who is using the driver in a project of his, I have copied his changes to this package, yay Free Software! If you want to use this code in a non-free piece of software or you want to have me do contract work for you on the code then contact me. Brother makes a very nice tape printer that prints on self laminated tape, the printer is hooked up to a pc through a serial port and relatively easy to control. It should be trivial to write a normal printerdriver from this, but I wanted to control the printer directly because printing has to be pixel perfect as the tape is only 82 pixels wide (12mm tape), so I use the driver directly in my own application. Try to print as many pages as possible pr run as the printer wastes about 15mm of tape pr job. Note that Bother has discontinued this model, so they are going to become very cheap as stores need to stock up on the modern usb based models, not that serial is a disadvantage as the data is usually quite small, so go buy a bunch of these if you can. The license of this code is: "Ask before you use it" or GPL, so if you think GPL is ok for you, go right ahead and use it under GPL, if GPL isn't good enough, ask me for another license. Well, with no further ado, here is the driver and example code: pt2500pc.tgz [12K].